Linun napkins and guest towels are a heavier weight than our 3-Ply napkins and resemble more of a heavy weight very nice paper towel than a typical napkin. 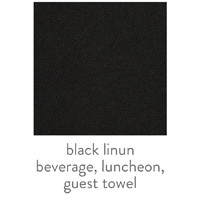 Linun napkins and guest towels have a beautiful texture (that resembles actual linen) and have a more elegant yet sturdy feel than the 3-Ply napkin. These are our top-tier solid color napkins and they are great for occasions when a more real feeling linen napkin is desired, messy outdoor dinners, crawfish boils, barbecues, lobster roasts and other events where more absorbency is needed. They are available in a wide variety of solid colors and ink colors may be matched to the napkin color to use on any of our imprintable items. 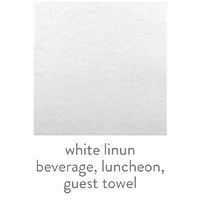 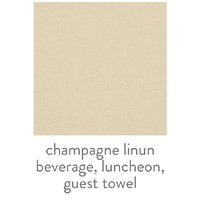 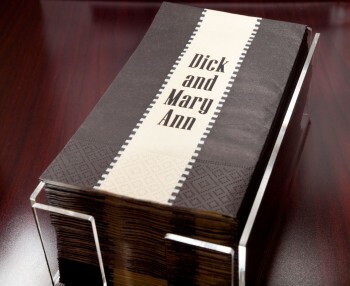 Personalized Linun Napkins and Guest Towels are available in 3 sizes (beverage/cocktail, luncheon, dinner/guest towel) and 21 colors with low minimums starting at quantities of 50. LB Beverage 5.0" 5.0" 3.75" x 2.50" 3.75" x 3.75"
LL Luncheon 6.5" 6.5" 5.00" x 2.50" 5.00" x 5.00"
LT Towel 4.25" 8.0" 3.25" x 2.50" 3.25" x 4.75"